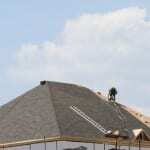 We put all our manpower on one commercial roofing job at a time in Newmarket. For the most part, the size of a commercial roofing project is much larger than that of a residential roofing project. Because of that, you need a company that has the dedication and manpower to complete the task at hand in a time-efficient manner. That is why you should trust our team at Slippery Slope Roofing for your commercial roofing installation or repair. We get the job done on time and on budget, so your Newmarket, Ontario business is not disrupted any more than is absolutely necessary. We accomplish this feat by putting all our manpower on one commercial roofing job at a time. Nothing else has our priority other than completing your job professionally and efficiently. You do not need workers making noise overhead day after day. That is distracting to your staff and doesn’t exactly put customers at ease, either. In addition, we are careful to keep the site clean, so your business continues to look professional and there isn’t anything around to endanger you, your staff, or your customers. Safety is our number one priority! In addition to our pledge to get your commercial roofing project done quickly, you also gain from the 50 years of combined experience between our owner and foreman. That assures you of a professional result with proper underlays, quality materials, and expert workmanship. We are fully insured with WSIB and accredited by the Better Business Bureau, so you can be sure you’re getting the best commercial roofing services in the area. If you need repairs or a replacement roof estimate, give us a call today. We’ll get you on the schedule pronto.